Your grand-daddy’s Superman this is not. This review may contain spoilers. If you are sensitive to such things please do not read. The origin of the big blue boy scout is one of the most recognized stories in human history. Ripped from the pages of Judeo-Christian mythology and becoming an icon in his 75 year history,Superman embodies the potential for the seemingly meek and ordinary to achieve greatness. The film opens with the birth of our hero and leads into a new understanding of the entire history of krypton and Kal-El’s heritage. Russell Crow provides a moving and endearing portrayal of Jor-El, a father who wants nothing more than to give his son the future he deserves and puts all his wants,hopes,and dreams into the shuttle that carried his infant son to a distant star. The new details relating to the history of kryptons social structure seemed slightly convoluted involving a genetically engineered race which informs the majority of the villians plan and a slight reduction of this might have served to leave more screen time for the development of character motivation. Not to say that what was provided In that regard wasn’t sufficient,it was, but the pacing was so fast and so much information needed to be provided within the running time that it was easy to feel that the film would move ahead before one had time to fully absorb the emotional impact of the scenes. This is truly a small complaint however and really only slightly hinders the first third of the film dealing with Clark Kent’s development from child into superman. The filmmakers truly made a bold choice, In that instead of giving you the origin in a straight forward timeline we see scenes from Clark’s past intercut with scenes from his present meant to evoke very specific emotional responses and keep the films pacing feeling much faster. It is in these scenes of young Clark growing up that Kevin Costner and Diane Lane truly shine as Pa and Ma Kent,the foundation of our hero’s moral code,and give the film a real grounding and stability. 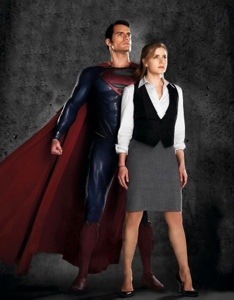 One of the the many bright points of the movie was the portrayal of Lois Lane by the amazing Amy Adams. The moment she said her first line there was no doubt that she completely embodied the character. Some say a hero is only as interesting as his villain. I don’t know if that’s true but I will say that Michael Shannon steals every scene he is in as General Zod. The gravitas he brings to every line, look, and action leaves one In chills as he rips a hole through the planet in his genocidal quest to resurrect his home-world. Now for the one actor you all want to hear about. Henry Cavill as the titular Man of Steel is exactly what the Superman mythos calls for. He talks like a cop, carries himself like a fireman and manages to play even the lighter moments with just a subtle hint of the loneliness and pathos that being the only one of his kind brings. Director Zack Snyder, writer David S. Goyer, and producer Christopher Nolan have brought a vision to the screen that keeps the spirit of Superman alive while wrapping it in a grounded and believable world. As a visual spectacle the movie never disappoints and manages to paint glorious back drops of the alien world Krypton, Smallville, and the hustle and bustle of Metropolis, all while keeping a unified tone and focus. Well implemented special effects, gorgeous cinematography, and fast paced action, with truly deep performances make this a must watch for any superhero fan. This entry was posted in Movies and tagged dc comics, heroes, Man of Steel, Superman. Bookmark the permalink. ← A pilgrimage of the nerd.